Our DIY guide for how to lay turf and create a great-looking home lawn! There are three basic ways to create a new lawn for your home. You could sow grass seed, although this can take a long time to establish. You could opt for small seedlings planted at intervals, but this can also take a long time. Your third choice is turf, which can be laid at virtually any time of year and creates an almost-instant lawn. For many homeowners, this is the simplest solution. However, while laying turf might be the most convenient option for the average homeowner, there are still a few key details you need to keep in mind. As such, we have put together this DIY guide for how to lay turf. Our DIY guide explains how to lay turf step-by-step, covering what kind of turf to buy, tips for soil preparation, how to lay turf, and how to water, mow, and maintain turf, so you can grow the stunning lawn your home deserves. The most important rule when buying turf is that you should lay it as soon as possible after it arrives. Don’t have the turf delivered until you’re 100% ready, because it is essential that rolls (or slabs) of turf aren’t allowed to dry out. Ideally, your new turf lawn should be laid on the day of delivery and then watered immediately. Dried out turf that has been left in the sun too long will struggle to prosper. These days, it’s easy to buy turf online. Turf websites provide a variety of grass types to choose from, often including a graph that specifies the turf’s winter colour, shade tolerance, wear resistance, salt tolerance, injury recovery, drought tolerance and other factors for each species. Proper mowing height for different grass varieties will usually also be listed. Your climate, soil quality, and location will determine which turf type best suits your needs. If you’re unsure which turf is right for you, don’t be afraid to ask the experts for advice. Turf is normally sold by the square metre, so it’s important to measure your yard properly so you know how much you’ll need (always add 10-15% for contingencies). If your yard is square or rectangular, just multiply length by width (e.g. 10m wide by 4.2m long = 42 square metres). If your yard is circular, multiply the radius by itself and then by 3.14 (e.g. 6m x 6m x 3.14 = 113 square metres). If you have a triangular yard, multiply the height by the base width and then divide by two (e.g. 10m x 6m/2 = 30 square metres) . If you’re buying online, the cost of your turf will depend on whether you choose ‘supply and deliver’, ‘supply and lay’ (if you don’t want to lay the turf yourself), or ‘pickup’. Usually, professional turf layers will only lay turf on sites that have been suitably prepared beforehand. Popular turf varieties in Australia include Sir Walter, Palmetto, Sapphire, Matilda, Empire Zoysia, Windsor Green Couch, and CT2 Sports Couch. Prices for turf can vary, so it’s definitely worth shopping around to ensure you get the best deal. Many Aussie soils are simply not suited to growing grass – at least not without a fair amount of help. Some soils have too much compacted clay, which means air and water can’t penetrate to the roots. Others are too alkaline or acidic. Worst of all, some soils seem particularly good at growing weeds but nothing else! The ideal soil for growing a lush, healthy lawn is a sandy loam with a pH of 5.0 to 7.0. If the soil’s pH is below 5.0, you can add lime to improve the soil quality. Alternatively, if the soil is too alkaline (pH 7.5 and higher), you can correct it by adding gypsum or sulphur. One of the biggest mistakes made before laying turf is failing to eliminate existing weeds. This may take up to 3 weeks, but it’s an essential step. For tough weeds (and old, tatty lawn you want to get rid of) you may need two applications of suitable non-residual glyphosate weed killer spray (ask your nursery for advice) spaced 10 days apart. You will then need to remove the dead surface after the recommended waiting time. Eliminating weeds in the preparation stages means you’ll have much less weeding to do once your turf lawn is firmly established . Your soil should be turned over to a depth of 15cm or so. Rake and lightly roll or water the area to create a firm surface, ensuring the area is free of rocks, weeds, and debris and is as level as possible. A pre-planting lawn starter fertiliser should then be applied above the soil and below the turf when you lay it. Your turf supplier will probably have a starter fertiliser recommendation. Neat edges are crucial for an attractive lawn. Turf is typically around 25mm thick, and should sit a little bit higher than paths or edges. Don’t rush your soil levelling job – the last thing you want is a bumpy lawn. Your turf will either be supplied as rolls or slabs. First, lightly water your pre-prepared soil area. Then, roll the turf out in a staggered brickwork pattern (i.e. so the short ends of rolls are not aligned), pushing individual strips together firmly without overlaps, gaps, or stretching. While you are doing this, be sure not to kneel on the turf or stretch it. 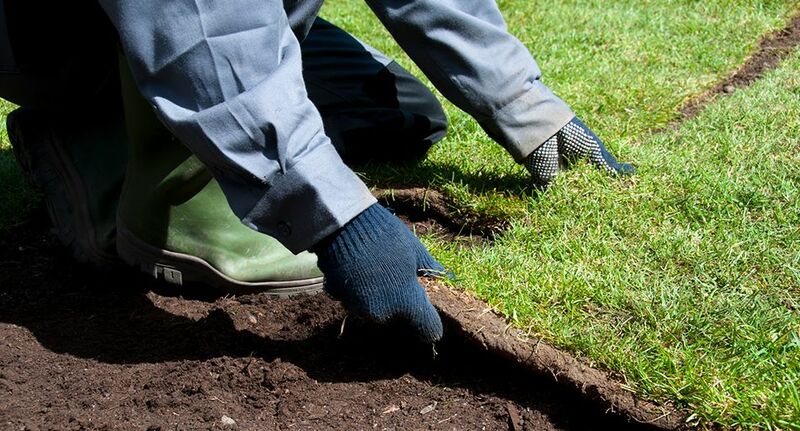 It is best to start at the outer edges of your yard and work your way towards the centre, so you don’t have smaller pieces of turf on the perimeter where they tend to dry out. Further, you should always cut your turf with a sharp knife or secateurs – never rip it. If you’re laying turf on a slope, plant it across the slope. Otherwise, water will run down between the rolls and wash away your carefully prepared soil underneath. Once your turf has been laid, water it immediately. This is essential to activate the fertiliser, prevent it from drying out, and improve the effectiveness of the final step (rolling). Don’t be shy with the water – you want to saturate the grass mat and wet the soil underneath as well. Finally, your new turf lawn requires a good rolling, which will even out any small bumps, firm down the turf, squeeze out pockets of air, and help bond the grass roots to the soil. Lawn rollers come in many types, some with spikes for aeration or reservoirs for water, but a simple handheld roller weighing around 45kgs should do the job. Make sure you water your new turf lawn every day for the first four to six weeks (depending on the temperature and weather conditions) to help the roots to settle in. Thirsty turf can quickly turn into dead turf, so keep it moist with regular watering. Additionally, you should keep people and pets off the surface for at least one month. As the roots take hold, you can gradually reduce the frequency of watering to allow deep rooting, but keep in mind that in super-hot, dry conditions, you may need to water your turf up to four times per day. Two or three weeks after laying your turf lawn, the ground will be a bit firmer, you’ll be watering it slightly less frequently (but more deeply – you want to encourage deep root growth), and you can start thinking about mowing. The first mow should just remove the tips of the grass: use your highest mower setting and make sure the blades are sharp. Regular mowing helps strengthen your lawn’s root system so you get robust growth and a fresh, green colour. You might get away with mowing every 5 weeks or so in winter, but a healthy summer lawn may need mowing as often as once per fortnight. Finally, fertilise your new turf lawn about one month after laying it, using a complete lawn food. There are plenty of good fertilisers to choose from, so ask your local gardening store for advice on which one will best suit your needs. Or, if one of your neighbours has a particularly beautiful and robust lawn, don’t be shy asking ask what they use! And remember, if you’re a keen gardener with lots of nice tools, don’t leave them where opportunistic thieves can grab them. Lock up your house, your shed, and your garage when you’re away, and ensure you’ve got adequate contents insurance to cover you for loss or theft of your valuable items.